and you think they might fit you. and you could walk much further than a mile. marred by a life of experience. as I expect yours would not feel comfortable on my feet. as your trail was carved out for you. but your journey is yours, as mine belongs to me. just as mine were meant for me. and our shoes will take many steps together. I hope we walk much further than a mile. ← Has anyone seen my patience? I seem to have lost it. This is lovely. 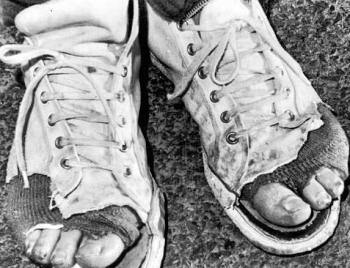 We may walk together with others, but ultimately, it’s our own shoes we need to fill. Another well stated perspective. Nice. My feet are definitely meant for my shoes if your shoes are the ones pictured above. Although I’m not a fan of shoes, my would definitely be better to wear than those. But summer is sandals or bare feet, so you’re safe! My sore, gimpy feet refuse to wear sandals. They rebel if I try.